At PCM Products, we have total control of your parts from start to finish because all the processes are done in our 50,000 square foot facility. This enables us to work with your project from prototype to short runs or high volume production. Having the in-house capabilities allows for better lead times, very competitive part pricing and most importantly quality control. 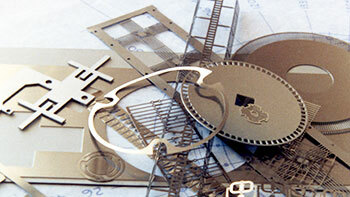 We can etch extremely small components as well as large parts up to 58" wide. In-house secondary requirements such as plating, heat-treating, forming and finishing are all available to complete your project. PCM Products can etch all metals, all alloys and even exotic metals.We provide etching of Copper, Brass, Nickel, Stainless Steel, Titanium, Niobium, Zirconium, Molybdenum, Aluminum, Inconel and Beryllium Copper. Normal lead time is 2-3 weeks, but we can supply parts in 2-5 days if needed. Copyright © PCM Products All rights reserved. Site Designed and hosted by Design-2-Part Web Design.